Yes. All this often ignored that #2s tend to be #2s for a reason. Someone referenced 2008 as showing how fast he and Kimi could be, if anything history has taught is that both of them were handed a rocket and outdone by a better driver. Massa was not a poor driver, he was F1 calibre. But he is just one of many who was good enough to be here, but was nowhere near the level of the F1 elite. I don't know,you tell me. You can ask Rubens; he was by far unhappier than Massa, getting against the best driver in the era (if not ever), yet he resigned twice. I agree that the age is the time that it should have been his peak years (although that is not set in stone, is it? ), but you can't deny that the situation would hardly help his morale. Ok, thanks. English is not my first language, so there you go! If Lewis goes to jail for not paying taxes, there will be another chance for a second comeback of Massa. You win and lose as a team. He had a car that was quicker than anyone else's, you can't have everything. Besides, in Singapore Hamilton was just as much a victim of crashgate. He was running second and probably would have inherited the win after the Ferrari pitlane troubles. He also had a puncture when running second behind Massa in Hungary and ended up 5th. What about Australia, first corner, first lap, no TC for the first time since 2001 and him spinning into barrier? OK, let's let that slide, he suffered engine failure after all. What about Malaysia and him spinning out of P2? What about Turkey and him not defending against Hamilton well enough? Only 1-2 laps more and Lewis would end up behind Kimi, not in P2. What about Monaco and him running wide in St Devote and losing P2 to Kubica? What about Silve... well, maybe we shouldn't even mention that. Still, even with badly handling car or wrong engine settings to spin 5 times? What about Hockenheim and him not defending at all against Hamilton? Braking problems or not, at least show some resistance when your opponent is the title rival. What about Monza and him losing 4 seconds while overtaking Rosberg illegally, handing position back and attacking again? He finished only 1 second behind Heidfeld. What about Japan and him hitting LH and earning drive through penalty? Yes, he damaged Hamilton's car, but only gained 2 points through all of this, so was it worth it, when potentially more points in clean race were on the table? Massa at his best, in superior car, was beaten by Hamilton at his worst, in inferior car. And thank god for that, because his championship would be on the same level as Irving winning in 1999. He deserved victories, but not championship. Had a good career and made the most of his talent. Ah wait you missed when he clouted Bourdais and Bourdais got the penalty! So .... this doesn't look great for the FIA's new President of Karting. 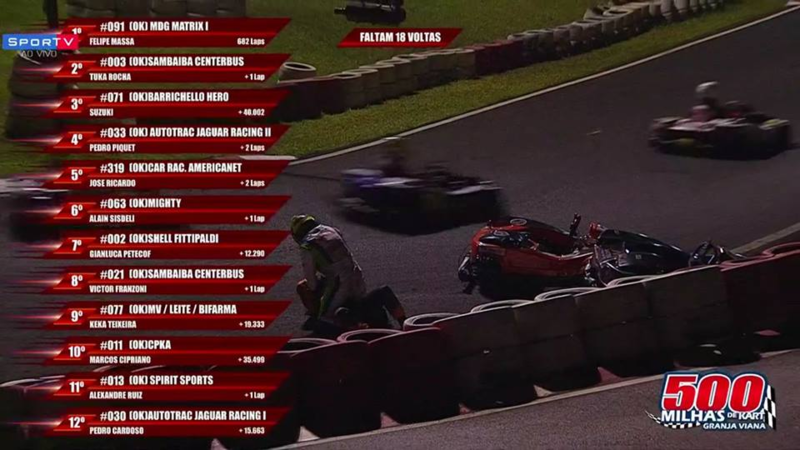 The story I've read is that apparently Massa took the lead with 19 laps remaining, at which point a backmarker from Massa's team began holding back the P2 kart so that Massa could increase his gap. The P2 team's drivers then began trying to take Massa out, and Massa's teammates retaliated. Two karts from the battling teams crashed out and began fighting right on the track, resulting in the disqualifications of both teams. The team of Rubens Barrichello took the win. that’s incredible, how I wish I could see a full live broadcast of that. And it was necessary once. He had no more or less chance for victory than Kimi does with Seb now or Massa himself had with Kimi. Ferrari don't operate any differently. The quicker driver gets the backing once he's the clear championship contender. No more or less. Circumstances dictate what that entails and yeah that meant some ugly calls when you can't rely on your cars pace alone but the reason they almost all went to Alonso was painfully obvious. He was quicker. Much quicker. And far more adaptable to those troublesome cars they produced from their dodgy wind tunnel in that period. I am one of those who have appreciated Massa, and regret the lack of respect given to him by so many know-it-all forum "experts". Few here have claimed that Massa is of the level of Schumi or Alonso, yet it borders on ignorance to not credit him with being a very good to great driver. If not, what does it say about other drivers that Massa came within a turn in the last race of being a WDC? By putting down Massa you are also putting down the 2008 field, including Lewis in effect. Isn't it interesting that so many forum "experts" have so little respect for Massa, yet, his fellow drivers and most F1 personnel seeming hold him in much higher regard.... but then what do they know compared to our forum? Well said. People need to realize that although Massa was not top tier in F1, he is still an extremely talented driver, a driver that Williams is finding very difficult to replace at this time. Losing to your team mate in 11 seasons out of 15 isn't a good look on any driver. Why only look at the one championship run and ignore the long periods of mediocrity? Why do other drivers not get that treatment? What other drivers do you have in mind? Which of them came within a point of being the WDC? What other drivers have teamed with four different WDCs who total 11 championships? Which of those drivers you are concerned are not getting "that treatment" also have 11 F1 wins? Which of them seem to have so much esteem within the F1 ranks? Is Massa an all time great? Of course not. However he has been a good driver who has had some fine drives. As for your suggestion that I have ignored "long periods of mediocrity, perhaps it is because I don't consider him a mediocre driver. The way some are treating him in this forum is not, in my opinion, giving Filipe Massa a fair shake. Massa is a Coulthard / Webber level guy, at best. Is that a bad thing? I don't see either of them as mediocre or less either. I think different people have different benchmarks for mediocre. I use those two as an example as I think they are very average drivers, who appeared to have good moments which may well have been down to them luckily being in the right car (and they all certainly found themselves in the strongest car in the field at various points in their career). By your definition, then we can reduce Alonso, Hamilton and Vettel to the level of slightly above average. Many fans fail to understand the internal team politics and dynamics. Alonso was supposed to be the next big thing at Ferrari, and he initially proved that this may come to pass. And not matter how much money any team has, they do not have infinite resources. So whenever Alonso complained about something and the engineers went to work on his complaint(s), it was to the disadvantage of Massa. My brakes feel spongy. Our brake specialists are currently attending to Alonso's complaint, they will get to you when they are finished. IMO he is darn quick. And he also brought a level of humanity to this cold, cynical, and impersonal sport, something it really needs. In terms of being mediocre. I think you are taking that to mean something harsher than it does. In a field of 20 drivers I guess those ranked 7-14 would be mediocre. How many years of Massa's 15 year career would he be ranked above that? How many seasons does he get into that top third? Read closer and i bet you can figure it out. I will respond better when i can get on my computer, not on my phone, mikey. Will be home this weekend. I do feel Massa was in that top third for a few years though. Just another thought..
15 years in F1 doesn't happen for poor to mediocre drivers. I agree there have been times over his career he has been up in or around that top third but IMO he has been in the middle third much more often which is why I think it's fair to rate him as just that. I actually though about what you are alluding to in your last sentence after my last post. I certainly think that if you listed all the drivers that have raced in F1 since Massa's debut he would be in the top 33%. I concluded that probably means that whilst he has generally been a mediocre driver he has had a very good career. If Massa hadn't been partnered with Michael Schumacher at Ferrari in 2006, 2007 and 2008 would he have still managed to finish the WDC so highly and would he still be considered average / mediocre by some? If Massa had been partnered with Michael Schumacher in 2007 and 2008, I'm pretty sure nobody would be talking about him being a near-WDC. I agree with the general point being argued that Massa wasn't a bad as people make him out to be, but I also think that drivers age differently, and Massa is well past his peak. Alonso seems able to still produce the same performances as ever, but (subjectively, I admit) I haven't seen the same spark from Massa that he used to have in some time. He's had opportunities to fight for wins at Williams, and he didn't look at all ready to do it anymore. He was conclusively beaten by Bottas, in a team where you can't cry 'Ferrari favoritism' like people are wont to do if the record of a Ferrari #2 driver is brought up. I would say that Massa was at one point among the top third of drivers on the grid. But I wouldn't rate him that way anymore. I think Massa is another whose career you can split into 2 parts, a la Schumacher; pre and post injury. Hindsight tells us that in 2008 he and Kimi may have well landed a rocketship and come in under par, but you only get that close to the WDC (and WDC winning cars) if you have something about you, and at that point in time, Massa certainly did. How many other 'mediocre' drivers can lay claim to pretty much owning a circuit like Massa did in Turkey? He probably went on a year or 2 too long in the grand scheme of things, but he never disgraced himself (plenty of good drivers have down the years) or got to the point where he was phoning it in (a la Damon Hill). He still looked racy when the Williams was good, clearly had the beating of Stroll, and was never a million miles away from the driver now expected to run Hamilton close in the sister Merc. All time great? Not a chance. Perfectly good F1 driver, who came within a rain shower of making the absolute most of what he was given? Absolutely. You are forgetting his Sauber years. He looked average a Sauber, average alongside Schumacher, good against Kimi and average again ever since. He's just about the most easy to place driver in F1 over the last 15 years. He's been team mate to or is only one team mate seperated from almost all the main players of the past 15 years. 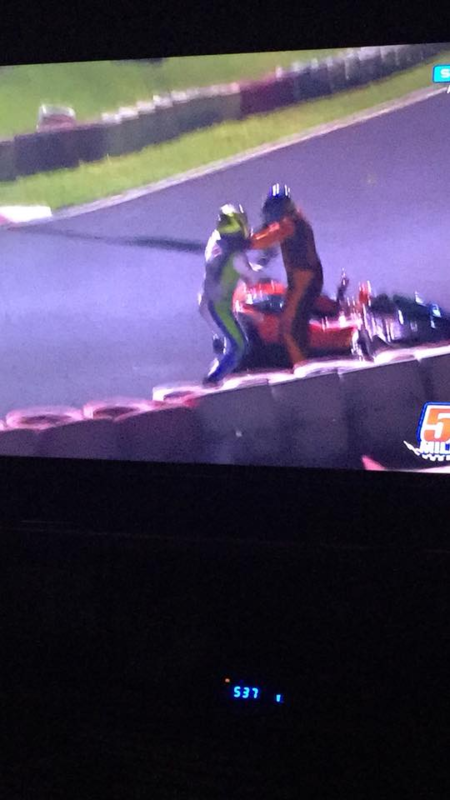 Alonso smashed Massa. Hamilton smashed Bottas who beat Massa. Vettel smashed Kimi who was roughly on par with Massa. Sorry it went over your head. I assume you meant that Alonso, Hamilton and Vettel are only slightly above Massa's level. I'm not sure I'd agree with it, though. Not what I meant at all. What I was getting at is... if one is going to dismiss Massa, Webber, and DC "very average" drivers because their success was due to being "lucky being in the right car"... then one can say that Alonso, Vettel, and Lewis may be only slightly better than "average" as they have often achieved success being in the "right car". I am not saying that is all they are, for I don't believe that either. I just don't think one can dismiss Massa's (or DC or Webber)so easily. Also, as I said before, merely average or mediocre drivers don't carve out 15 year careers in the supposed epitome of racing.... they would be long gone before then. Ah, okay. Then we're pretty much in agreement. Nobody can achieve anything in F1 without being in the right car. For Massa in particular I think the teammate head-to-head is quite unfair; during the prime of his career, he was partnered with exclusively world champions, including two whom many would rate as all-time greats. Just see Massa vs. Stroll for the difference between Massa and a driver genuinely unfit (or unready, to be more charitable) for the F1 level. Well this is where the different benchmarks of mediocre come in. If speaking in context of every driver in the world then Massa is the elite of the elite, but I believe he is being judged against the F1 field. Someone above put it well, drivers 7-14 are in the mediocre range. I believe Massa has spent his career here, with the odd great car making him appear temporarily higher. I'd argue Alonso, Hamilton and Vettel have spent their careers in the top 4 drivers with the odd exception.